Pick a Person, Place, Thing, or Idea — Ginger writes. Just ask Cash. All of last school year, we drilled over and over that “A noun is a person, place, thing, or idea.” We sat at the kitchen table and looked around us and named examples. Cash, animal shelter, dog, freedom. When I sit in the backyard to write letters, this is my happy place. If I didn’t worship Jesus, I’d worship the sun. Around 2pm, I move my chair to just the right spot for full afternoon sun. I grab a Bic Mark-It pen, always black, and a notecard from my stash. Sunglasses on. Shoes on, too. View of the lake. Penny nearby. Sailor asleep. Kids happy in the house. Phone under towel. Full water bottle. 30 empty minutes. When you find yourself in a similar situation, all set to write a letter, and ready to begin, you may not know what to write about. You may think there is nothing to write about. You may think there is too much to write about. You may think your handwriting is bad or your spelling is bad. You may not remember the last time you wrote a real letter. And you may not even be convinced that you want to write a real letter now. So, sit back and relax. Just pick a person, place, thing, or idea. Person - Is there someone in your life that you’ve been meaning to be in touch with? Someone you can thank for something? Someone who sent you an email that you haven’t replied to? Someone you miss? Someone you need to apologize to? Someone whose birthday is coming up? Someone whose birthday just passed? Someone you want to invite to dinner? In a world of 7 billion, you surely have some people. Don’t doubt that you have a voice that people want and need to hear. Place - Your place may not be in the backyard in the sun. Your place may be at the kitchen table or in your cozy living room spot. Your place may be sitting on the floor or standing by the island. You could prop yourself up in bed, or drive yourself to Starbucks, or walk around downtown until you find an empty park bench. Whatever makes you feel like you can write this letter today, that’s your place. Your place might be different next time, but don’t worry about next time this time. "How was your vacation?" OR "The kids and I were visiting my parents last weekend in NC and on the way home, our A/C stopped working." "When does school start?" OR "I’m excited about the new shelves we bought at Ikea for our homeschool room." "What have you been cooking for dinner lately?" OR "Every day for lunch the past two weeks, I've been making this Hidden Greens Protein Smoothie that my sister told me about." 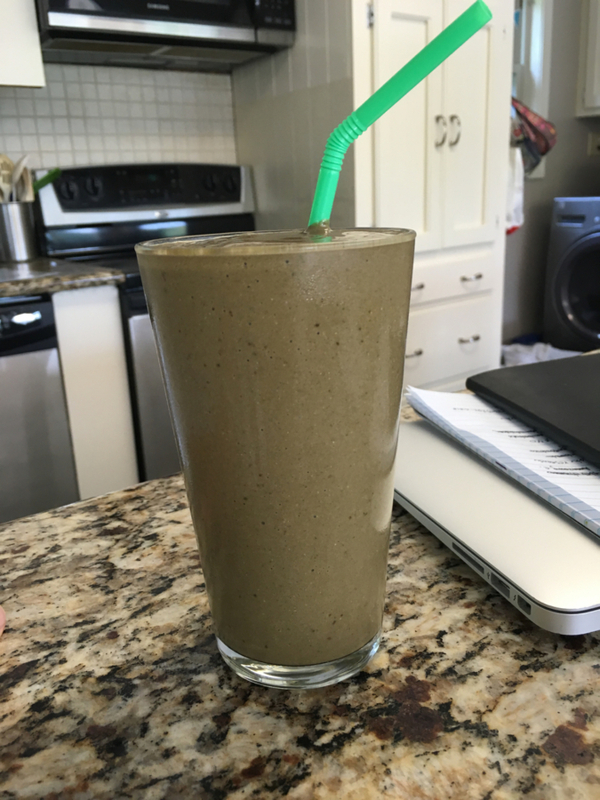 Hidden Greens Smoothie: 1 frozen banana + 1 cup frozen kale + 3 Medjool dates + 2T cocoa powder + 2T hemp hearts + 1T avocado + sprinkle cinnamon + 1.5 cups unsweetened vanilla almond milk + ice = Lunch! "What did you do for your birthday?" OR "We celebrated Story’s birthday last week with a trip to Build-A-Bear." "How is your pregnancy going?" OR "I am so thankful to not be pregnant so I can waterski all summer." There’s no need to ask or tell everything at once, but asking something first is what gets the conversation off to a pleasant start. What are you interested in knowing? What would you ask if you ran into this person in Costco? Ask those things. And then tell a thing or two. Never underestimate the value of minutiae. Idea - If you’re up for the challenge now or sometime in the future, go bigger than the simple ask-a-thing, tell-a-thing. Share an idea for a business you want to start or a goal you hope to achieve. Put in writing things that are in your heart. Process the process. Go deep, if it’s the right person. Or seek out the right person, and ask their advice or viewpoint or ideas. Throw out the idea of dinner together and jot down a few dates that will work. Ask if they’ll come. Or give an idea of what needs prayer, and ask if they’ll pray. Taking the time to stop, and see, and share what’s in that head of yours is as good an idea as any I know. I can't make any guarantees, but I bet you'll enjoy the writing of a letter more than you think. It's fun to not text, not email, and not Facebook for once. It's fun to use a notecard or a Trader Joe's card or even an old-fashioned piece of notebook paper. It's fun to fill up the blank page with words, and then to realize there was even more to ask or tell than you had room for. It's fun to use a real stamp. It's fun to imagine the person finding your card in their mailbox - the best surprise they've had all day. It's fun to say, I wrote a letter today. You, post office, envelope, pride.